Were you caught in the flood last Saturday? I was. I drove out to pick my son from tuition at 6:00 pm and was surrounded by water on the Jabatan Air road. Although I was driving an SUV, the stretch of flooded road in front was long so I drove into the Jabatan Air compound, with a small car following behind me. One by one, another 5 cars came into the compound too. We all sat in our cars waiting for the wind and rain to calm down. By 7:15 pm, I was totally bored and going insane sitting in my car so I drove through the water and onto the short stretch of road to get back to the main road. After picking Wey up, we got back to the Lido area and it was totally jammed. Jalan Penampang from Lido up towards KK was flooded. Lido Market was flooded. Houses were flooded and the access road to my housing area was flooded too. Anyway, that was one of the worst floods in the last 20 years or so. I had let Vero off early because we were going to my MIL's house for dinner but since the roads were flooded and restaurants nearby were all closed, I had to cook dinner quick because it was about 8:30 pm. I found a bottle of kim chi made by my friend Flora and some belly pork in the fridge and just made a quick stir fry of them. 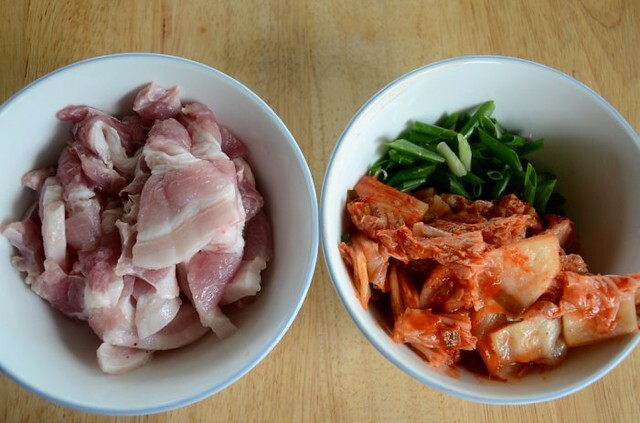 Surprisingly, Wey loved the pork and kim chi stir-fry even though he dislikes spicy dishes. He asked for the same thing the next day and then the day after. This is my fourth plate of belly pork and kim chi stir fry. Wey said it isn't my best because 1) the pork was fried too long, making it hard and dry 2) there's sugar in the dish. Guilty as charged, I have to admit. I had rendered most of the oil out because I was concerned for the fat boy ("But the point is I like the fat!" he said) and I had added sugar because the store-bought kim chi was extremely sour. Wey is my Gordon Ramsey, telling me exactly what he thinks of my food and the thing is, he's right nearly everytime. 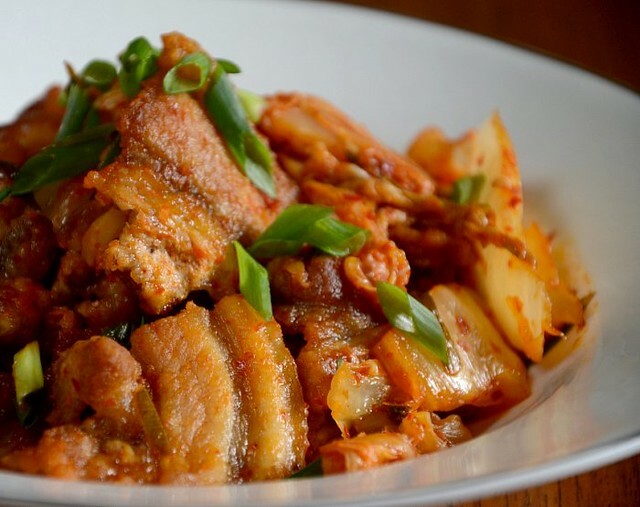 I'm sure there are many ways to stir-fry pork and kim chi but this recipe is the fastest (takes 15 minutes only to prepare and cook) and you need just two basic ingredients. Sometimes the simplest dishes are the best, especially in emergencies. 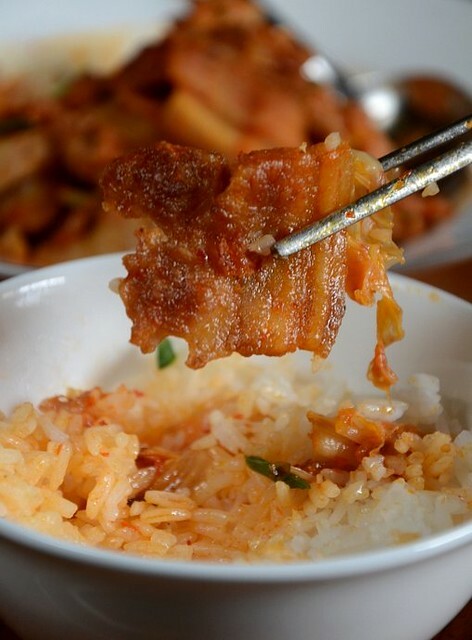 The amount of belly pork to kim chi is up to you. The pork must be quite fatty. You can add some oil to the pan but I prefer not to. This is overdone. Fry the pork until just done. 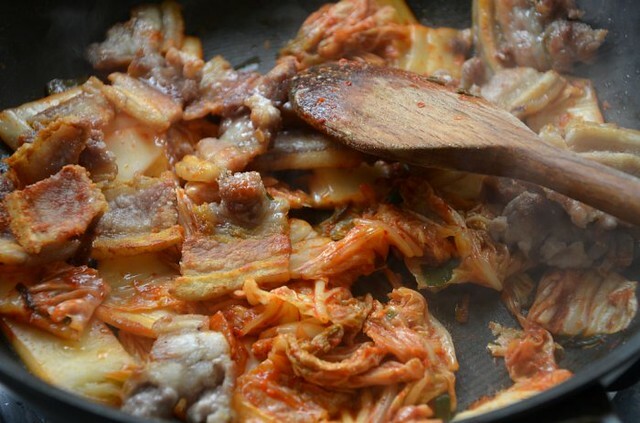 Add the kim chi and fry at medium low heat so that the kim chi flavor gets onto the pork. Add the scallions and drizzle some sesame oil over. 1. 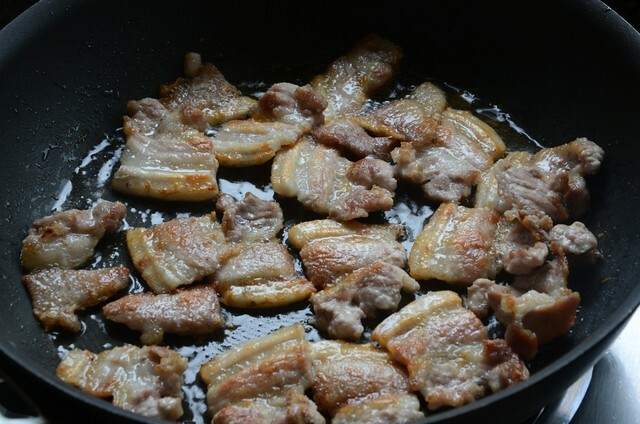 Arrange the pork single-layer on a non-stick pan and turn on the heat to medium high. Turn over when half done and fry both sides until lightly golden and just cooked. Do not overcook or the belly pork will be tough and dry. 2. Pour as much oil from the pan as possible, keeping the pork in the pan. Return the pan to the stove, add the kim chi and stir to mix the pork and kim chi over medium-low heat for about 2 minutes. 3. Add the scallions and drizzle some sesame oil over. Plate up and serve with hot plain rice. Yes, I'm going to cook this tonight. I have a big pack of Kimchi in the fridge and was wondering what else to do with it. did u try making your own kimchi? if u hv the right recipe, homemade kimchi is best cos u can use less chilli (if Wey doesnt like it too spicy). Neither do i like too sour so i dont ferment much. But use the correct fishsauce. I used to buy the Thai fishsauce but recently bought the Vietnamese Chin-su fishsauce cos was told it is more fragrant n less salty. But havent used it yet. I love simple recipes! I'm sure I can make this. Oookay, I'm heading to my nearest Asian supermarket to get myself some kimchi. this is what Australia TV commercial says. Quite true. The photo is shinning and opening apetite very much. 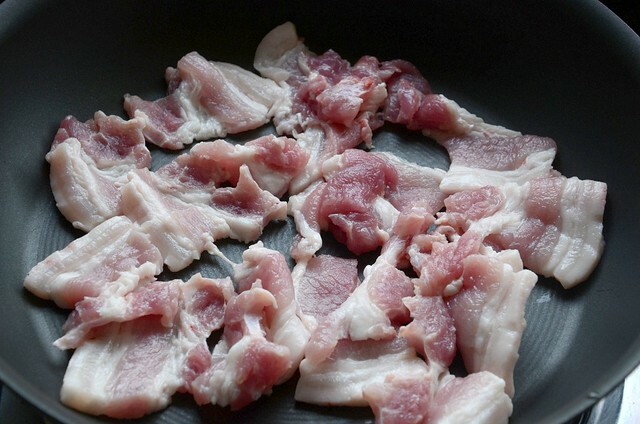 fooman: bacon IS made from belly pork and yes, you can use bacon for this dish but it might be too salty. mp: hi, long lost friend! yes i do make kim chi (see my recipe index) andi agree tt vietnamese fish sauce is good. 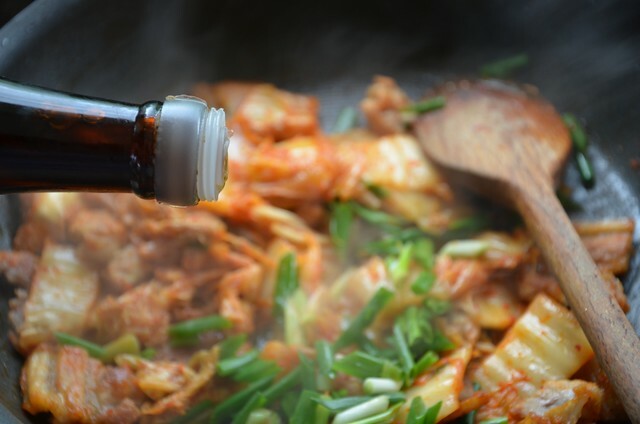 korean fish sauce, ironically, is the worst choice for kimchi bc it's not as gragrant and it's super salty,so salty tt it's nearly bitter. Thanks for sharing this recipe. I seldom cook at home because my MIL prefers to be in-charged. However, she had her hands full at work last week, so I "had" to prepare dinner. I thought of spicing up otherwise a bland dinner, and your recipe came to mind. I was ecstatic when she and the whole family absolutely loved it! Lovely & simple recipe, thank you. I served it last night to a house full of guests and made layered green tea and coconut jellies for afters.